If you’re one of the 10.4 million people who tuned into the new series of The Great British Bake Off last night, you’re probably now planning to spend the bank holiday weekend whipping up a storm in the kitchen. Or at the very least you’re seriously craving some cake. French pâtissier and owner of Cake Boy, Eric Lanlard has shared his favourite recipes with us, so you can impress everyone with your own sweet treats. In a small bowl, mix the cocoa and vanilla extract together and set aside. In a large bowl, beat the butter and sugar together using a freestanding mixer or an electric hand whisk set on a medium-high speed. Add the egg yolks and beat for one more minute. Add the cocoa and vanilla to the mixture. Stir the salt into the buttermilk, mix one-third into the mixture, followed by one-third of the flour. Repeat with two further batches of each until all are mixed in. Mix the bicarbonate of soda with the vinegar and blend this and the food colouring into the batter. Divide the mixture between the paper cases and bake for 20–25 minutes, or until a skewer inserted into the centre of a cupcake comes out clean. Allow the cupcakes to cool in the tin for 10 minutes. Then remove the cupcakes from the tin and allow to cool completely before frosting. To make the frosting: in a small saucepan, whisk the milk, flour and salt over a medium heat for 1 or 2 minutes until the mixture thickens and begins to bubble. Transfer to a small bowl and leave to cool. Beat the butter and icing sugar together until light and fluffy. Add the cooled chocolate, the milk mixture and the vanilla extract, and mix until smooth and fluffy. Spread the frosting or pipe it on to the cooled cakes, and finish by crumbling some cooked red sponge on the top (you may have to sacrifice one of your cakes) and dust with icing sugar. Preheat the oven to 180ºC (fan 160ºC)/350ºF/gas mark 4. Line a 12-cup muffin tin with cupcake papers. Cream the butter, sugar and seeds from the vanilla pod together in a large mixing bowl, using an electric hand whisk, until pale, fluffy and well combined. Crack in the eggs, one at a time, and beat until both are fully incorporated into the mixture. Fold in the sifted flour and lemon zest until well combined. Spoon the cupcake batter into the cupcake papers. Add 1 tsp lemon curd to the top of each cupcake. Bake the cupcakes in the preheated oven for 15–20 minutes, or until they are pale golden-brown and spring back when pressed lightly in the centre. Meanwhile, for the meringue, whisk the egg whites until soft peaks form when the whisk is removed. Gradually add the sugar, whisking continuously, until stiff peaks form when the whisk is removed. The mixture should be thick and glossy. When the cakes are cooked, turn off the oven and preheat the grill to its highest setting. 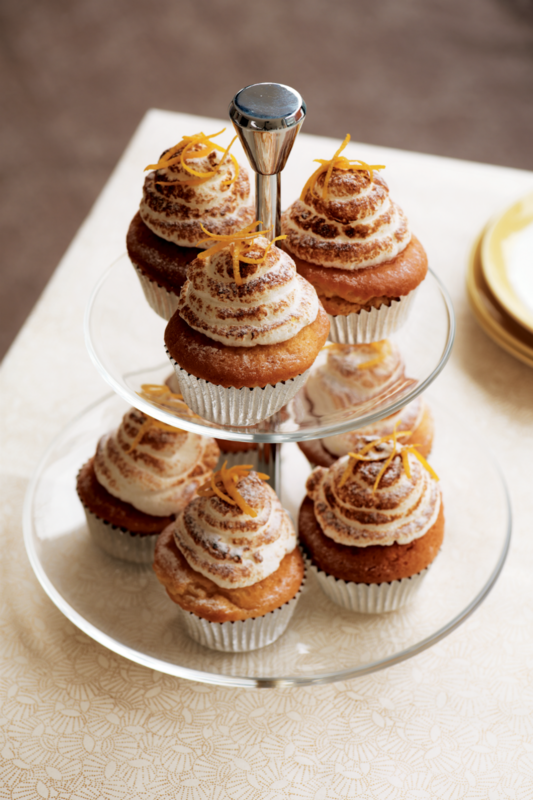 Spoon the meringue into a piping bag with a small plain tube and pipe in a spiral on top of each cupcake. Place the cupcakes under the hot grill for 2 minutes to colour (or you can use a kitchen blow-torch to toast the meringue). Melt the butter in a large heatproof bowl placed over a saucepan of barely simmering water, making sure the bowl does not touch the surface of the water. When it is half melted, add the chocolate. When the chocolate is completely melted remove from the heat and stir to mix in any lumps, then allow to cool for a few minutes. Dissolve the coffee in the vanilla essence, then add this mixture and the brown sugar to the cooled chocolate and butter. When these are fully mixed together, add the eggs and mix in. Sift the baking powder and the flour into the mixture and beat until all ingredients are well incorporated and the batter is thick. Then stir in the water a little at a time, making sure the liquid is entirely absorbed into the batter. Divide the mixture between the paper cases, filling each about half full. Place 3 raspberries on the surface of each – they will sink into the batter. Then fill each case almost to the top and place another fresh raspberry on top. 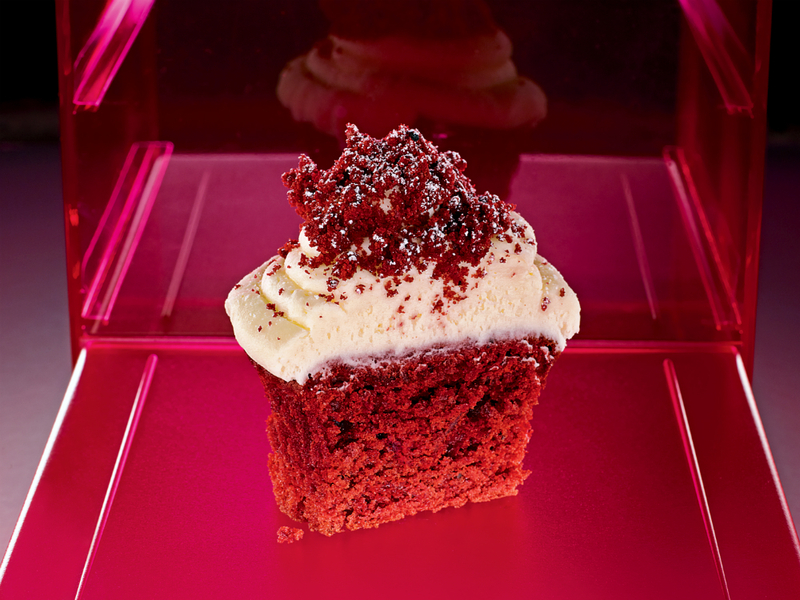 Bake for about 25 minutes, or until each cupcake is firm to touch or skewer inserted into a cupcake comes out clean. Leave to cool in the tin for 10 minutes and then transfer to a wire rack to cool completely. 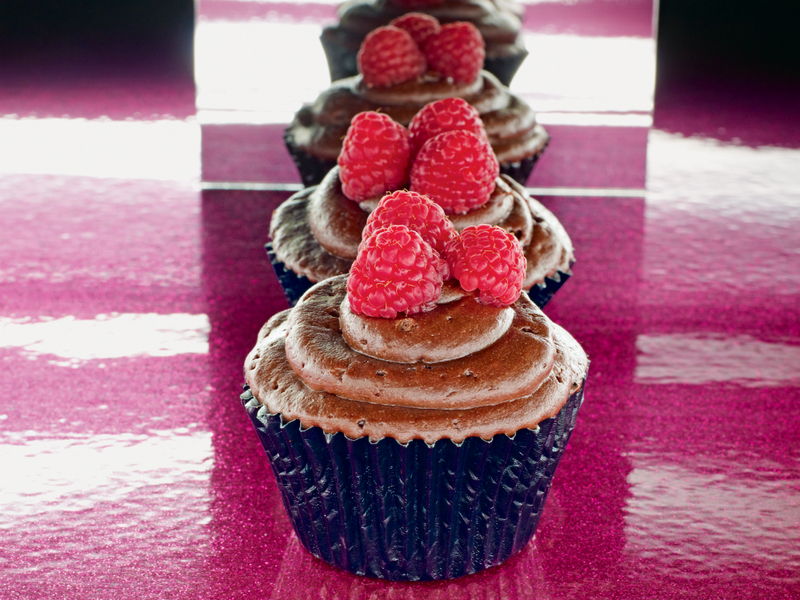 Once cool, pipe Chocolate Frosting in swirls on top of each cupcake and decorate with fresh raspberries on top. Heat the cream in a small saucepan, but do not allow it to boil. Put the chocolate in a heatproof bowl and pour the hot cream over it through a fine sieve. Gently stir the cream into the chocolate until the mixture is nice and glossy. Gently mix in the soft butter. Leave to cool completely. Once it is cool, ideally using an electric hand whisk, beat until nice and fluffy. Use to fill or top cupcakes or cakes. You can use this without the final whipping to give a dark glossy chocolate coating. Combine the flour, cocoa, chai mix, baking powder and salt in a bowl, and mix together. In a large mixing bowl, cream the butter and sugar together, using an electric hand whisk on medium speed. This will take about 3 minutes. Add the eggs one at a time and beat in well. Then stir in the vanilla. With the whisk on low speed, alternately add the flour mixture and milk to the creamed butter mixture and beat until well combined and smooth. Fill the cupcake cups with this batter up to three-quarters full. Bake the preheated oven for about 15 minutes or until risen, and an inserted skewer comes out clean. Let the cupcakes cool completely on a wire rack before frosting. For the frosting, combine all the ingredients in a bowl and mix with a wooden spoon until smooth. Refrigerate until the cakes have cooled. 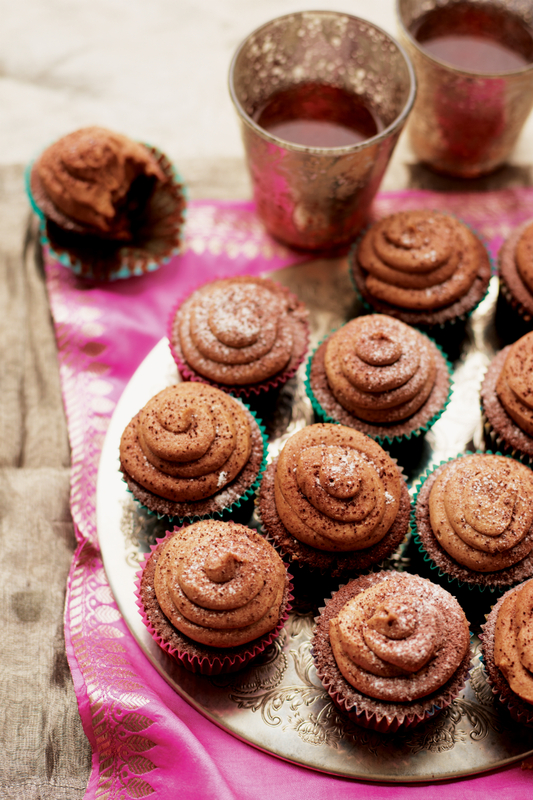 Spread or pipe the frosting on top of the cupcakes and, if you like, sprinkle with extra cocoa powder and icing sugar to decorate. Preheat the oven to 200°C/fan 180°C/gas mark 6, and line a cupcake tin with paper cases. In a saucepan, gently heat the butter and cola until the butter has melted. Remove from the heat and leave to cool. Sift the flour, baking powder and cocoa together. Add the cooled cola and butter mix, followed by the eggs and milk. Mix together until smooth. Divide the mixture between the paper cases. Bake for 25–30 minutes, or until a skewer inserted into a cupcake comes out clean. Leave to cool in the tin for 5 minutes then transfer to a wire rack and allow to cool completely before frosting. To make the Cola Frosting: Cream the butter in a bowl. Sift the cocoa and icing sugar together and mix into the butter a little at a time, alternating with additions of the cola. Beat to give a nice smooth frosting. (You may need to add more cola if the frosting is too stiff). Beat in the vanilla extract. 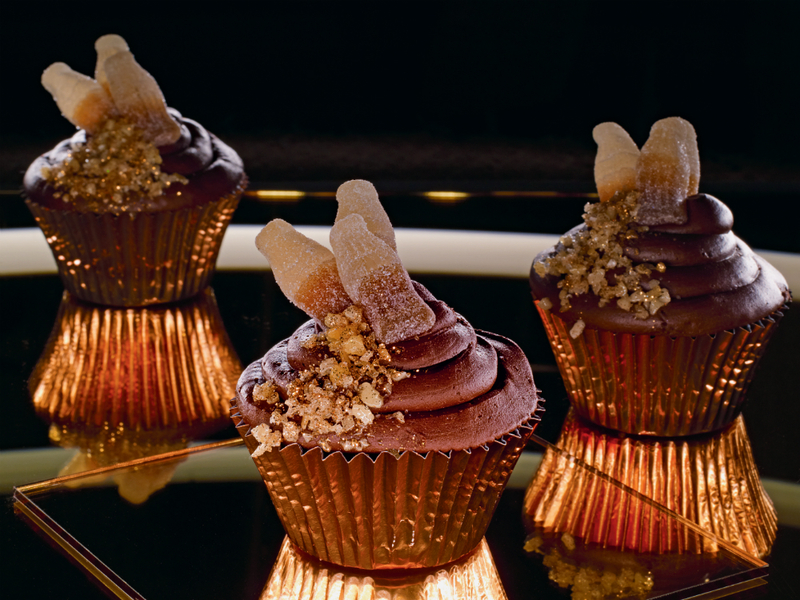 Pipe the frosting on the cooled cupcakes and decorate with either popping candy or cola bottles.